NEW DELHI and GHAZIABAD,India,March 14, 2018 IMT Ghaziabad (IMTG), India’s premier management school with a distinct focus on grooming Leadership through Innovation, Execution and Social Responsibility, held Convocation 2018 on March 12, 2018, at its campus. Shri Shiv Nadar, Founder and Chairman, HCL, Shiv Nadar Foundation, graced the occasion as the Chief Guest. 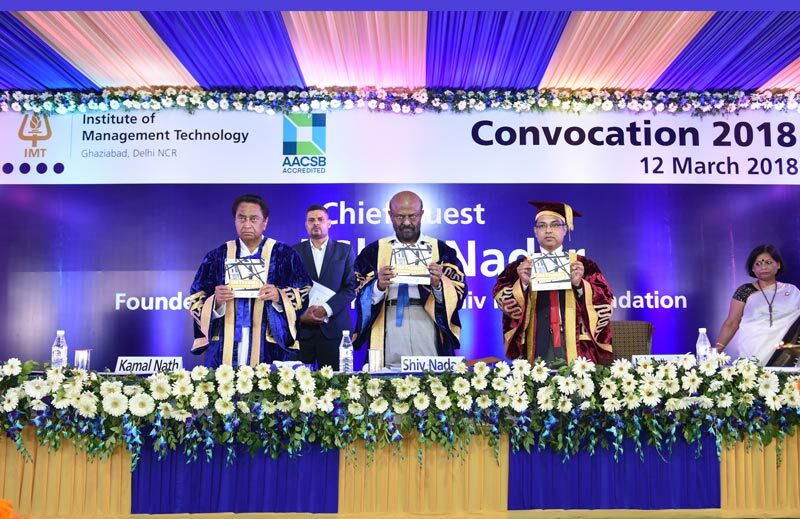 Shri Kamal Nath, President – IMT Governing Council, Member of Parliament, and Former Union Cabinet Minister presided over the event and awarded the diplomas to the graduating students. A total number of 593 students from six programmes namely PGDM – Full Time; PGDM – Marketing; PGDM – Finance; PGDM – DCP; PGDM – Executive; PGDM – Part Time, graduated this year at the convocation ceremony. The event also announced the prestigious Distinguished Alumnus Award 2018 and Vishit Jain Memorial Award. The 2018 Distinguished Alumni Awards were conferred upon Ms. Mamta Sakia, an alumnus of the Class of 1991, the Chief Operating Officer of Bharti Foundation, for Social/Entrepreneurial Contribution; and, Mr Sudhin Mathur, an alumnus of the Class of 1990, Managing Director, Motorola Mobility India and Country Head Lenovo Mobile Biz Group, for Corporate Excellence. Since 2005, every year IMT Ghaziabad confers a Distinguished Alumni Award to its alumni for exceptional contribution to the industry and the institute. Ms. Eesha Kaushal from the class of 2018 was declared the winner of The Vishit Jain Memorial Award for her all-round performance with noticeable impact and quality of achievements as a student. Also, the toppers of all six programmes were acknowledged with the award of Gold and Silver Medals. A list of the medalists is appended as Annexure 1. “Don’t stop learning when you step out of the institution. IMT has provided you a toolkit in cross disciplinary sciences that prepares you only for the initial dip. Keep the flame of curiosity alive. Absorb all the knowledge you can and keep growing,” Shri Kamal Nath added while addressing the students at the Convocation. IMT Ghaziabad Director, Dr. Atish Chattopadhyay delivered the welcome address and summarised the key milestones and achievements during the past academic year. “The graduating class of 2018 joined with me (in 2016) and are a part of the change journey. Some of them fondly call themselves ‘Change- preneurs’ and played a key role in making the new initiatives a success. This year, IMT Ghaziabad has revisited the program architecture, courses and the pedagogy of teaching and learning. The institute this year introduced experiential courses like Critical and Analytical Thinking, Design Thinking and Innovation, intertwined with courses on Effective Execution, Sustainability and Social Responsibility, which we believe has successfully laid the foundation for leadership development,” Dr Atish said. “Today when we talk about education 4.0 to support industry 4.0, we already started working on this. We at IMT emphasise on experiential and lab-based learning, through practice labs in the areas of Media and Entertainment, Digital Media and Consumer Insights, Finance (integrated with Bloomberg) and the SAP Next Gen Lab,” Dr Atish added, touching upon some of the new initiatives in the offing. The convocation ceremony was concluded with the national anthem and the procession leaving the lawns. This was followed by a brief media interaction with the Chief Guest, Shri Shiv Nadar and President, IMT, Shri Kamal Nath. About IMT Ghaziabad Established in 1980, Institute of Management Technology, Ghaziabad (IMTG) is India’s premier AACSB accredited management school with a distinct focus on grooming Leadership through Innovation, Execution and Social Responsibility. An autonomous, not-for-profit institute, offering highly sought- after postgraduate programmes over the past more than three- and-a-half decades, IMTG currently offers four AICTE approved programmes – Post Graduate Diploma in Management (PGDM) Full Time, PGDM Executive, PGDM Part Time, and PGDM Dual Country Programme (DCP). While the first three programmes are offered at the IMTG campus in Ghaziabad, Delhi NCR, India, the PGDM DCP is offered in collaboration with IMT Dubai campus. The Post Graduate Programme in Management (PGPM) is the latest addition to the list which leads to PGDM Part Time. IMTG has been consistently ranked among the top management institutes of the country for its leadership, faculty, research, student selection process, curriculum, pedagogy, industry interface, internationalism, placements, and infrastructure. Today, IMTG is the proud alma mater of more than 300 C- suite executives and thousands of professionals serving in leadership positions in the best-known organisations in India and the world, in key business functions of Sales, Operations, Human Resources, Consulting, Information Technology, Marketing, and Finance among others.